While celebrating made advances on the second anniversary of a peace deal with Colombia’s former FARC rebels, the United Nations and the European Union said Saturday that many communities “still lack fundamental guarantees” that would allow peace. 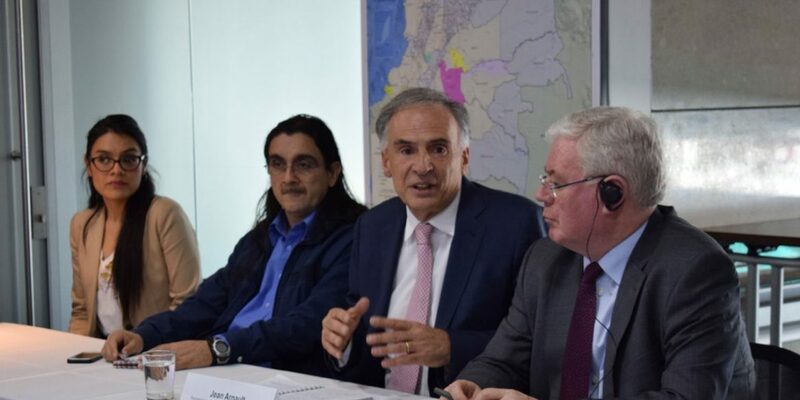 The United Nations’ mission chief Jean Arnault and the European Union’s special representative, Eamon Gilmore, stressed in a statement that, despite significant advances, “two years after signing the Final Agreement with the FARC, the communities” in provinces like Cauca and Nariño and the Catatumbo region in the northeast of Colombia “still lack fundamental guarantees” from the state. The challenge is undoubtedly to increase the presence of state institutions in order to deliver the peace dividends to the territories the communities seek: security, education, health, land, infrastructure and development opportunities that are alternatives to illegal economies. Colombian President Ivan Duque, who has opposed the peace process, ignored the anniversary of the agreement that resulted in the demobilization and the disarmament of the FARC, and the coming into force of a transitional justice tribunal and a truth commission. Many of the president’s political and economic backers are accused of war crimes and could be called to justice or lose face before the Truth Commission that formally begins its investigations on Monday. Progress has been difficult, but the Special Jurisdiction for Peace, which seeks to combine full respect for due process, victim participation and restorative sanctions for participants in the conflict is now under way; the Truth Commission is about to begin its work of clarification, recognition and reconciliation throughout the country. We trust that, together with the Unit for the Search for the Disappeared, this System of Truth, Justice and Reparation will allow the country to achieve the right balance between the demands of Justice and the prerequisites of peace. Arnault and Gilmore reminded Duque and his allies that their criticism of the peace deal is not shared by the international community, which unanimously supports the peace process “as it has stated in many fora, including the United Nations Security Council,” the top officials said. Beyond the political dynamics, in the territories affected by the armed conflict there exists a general will to take advantage of the opportunities arising from the Peace Agreement. This desire unites peasant communities, local organizations, young people, businessmen, women, ethnic minorities, former guerrillas committed to reincorporation into civil life, [who are] all convinced that today there are unprecedented options for development, coexistence and reconciliation. The peace agreement with the FARC ended an armed conflict between the former guerrillas and the state, which has long been controlled by dynasty politicians like Duque and his predecessor, Nobel Peace Prize laureate Juan Manuel Santos.